The SEO Writing Assistant (SWA) gives any writer the ability to check the SEO potential and originality of a piece of content in real time as well as how easy to read their text is to users. SWA is available as an add-on for Google Docs on Google Chrome, Firefox, Safari, and Edge browsers and can also be installed as a Wordpress plugin. 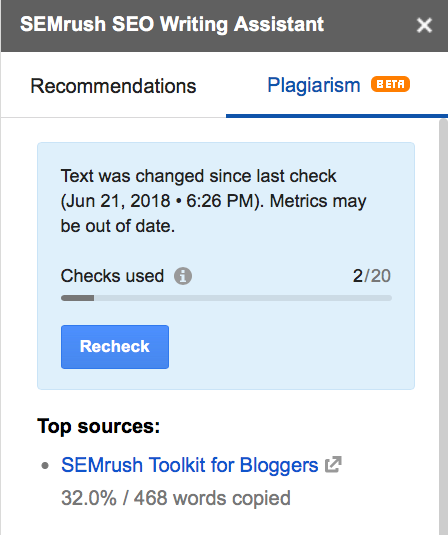 If you do not use Google Docs you can also check your content directly from the SEMrush interface. Connect an SEO Content Template to your Google document or WordPress draft, and SWA will analyze how well the text complies with our SEO recommendations based on the top 10 ranking pages for your given keywords in a given location. 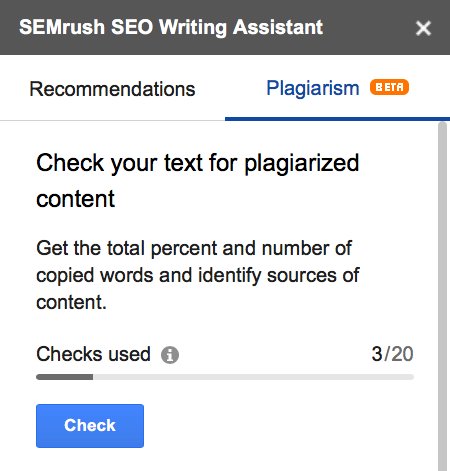 Check the originality of a piece of text with the plagiarism checker feature. Find SEO Writing Assistant in the Chrome Web Store and click on the ‘Free’ button. You will be taken to a new Google document. Give your permission to run the add-on and locate it in the ‘Add-ons’ tab. When you select ‘Show’ the SWA will pop up as a sidebar to the right of your document. Log in to your WordPress admin account and search for SEMrush SEO Writing Assistant in the Plugins section, or follow this link. Once you find it, click on ‘Install now’. Next, go to your ‘Installed plugins’ and activate SEO Writing Assistant. Go to the Page or Post you want to optimize and click on ‘Connect SEO Content Template’ by logging in to your SEMrush account. You can drag your SWA panel to the right-hand side if you wish. To create a new template, all you have to do is enter your target keywords, location, and device (desktop or mobile). 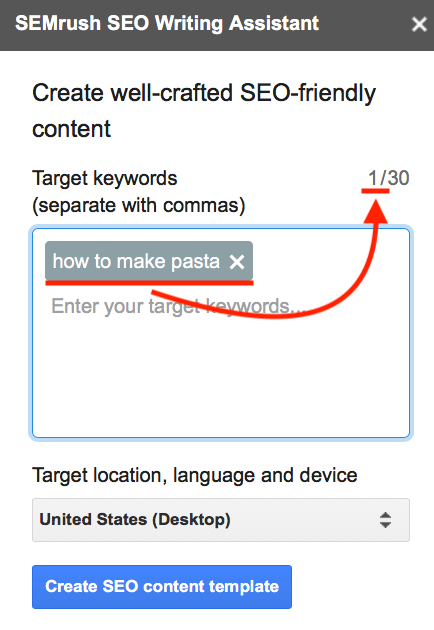 When you’re finished, hit the ‘Create SEO Content Template’ button. If you want to adjust your recommendations you can change your target keywords, location or device, click on the pencil icon next to your keywords. Next, type in new keywords and change your location up to city level, device or language. And don’t forget to click on the ‘Change keywords’ button on the bottom when you’ve made changes. Note that changing target keywords will create a new SEO сontent template and your current recommendations will be lost. A new template will take new keywords from your SEO Ideas limits. If you want to know how many SEO Ideas units you have in your account, you can review your limits from your Subscription Info page. Just below the keywords and title, you will see if all of the links in your document are link correctly. they are updated live depending on the changes you make in your text. Overall score is a live metric which shows the quality of your content by taking into account all of the metrics below. The closer the number is to 10, the better SEO optimized your text is. Words will calculate the number of words in your text and will set a goal according to the average word count of your rivals’ content. You can reset the target word count for your text manually by clicking on the pencil’s icon. Target keywords are the core of your text, on which all the recommendations are based. You can change them at any time to change the topic or get more precise tips for your content. Recommended keywords are words that are semantically related to your seed keywords. Once you use them in your content, they will be highlighted with green in the doc. Hover over any of them to see each keyword’s monthly search volume and keyword difficulty score. 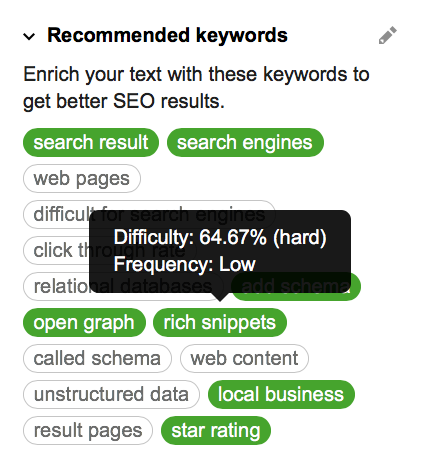 This makes it easy to gauge which keywords would be most beneficial to target due to their low difficulty (low competition). 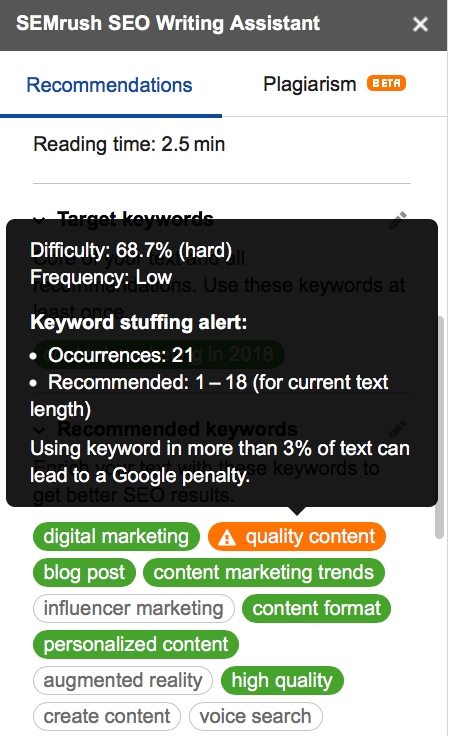 If you see (n/a) next to your recommended keyword’s volume or difficulty, it means we don’t have this data in the SEMrush database. Title shows you recommendations for your headline. You can also download some extra recommendations from SEO Content Template in a Word doc format if you click on the link at the bottom of the tool. Readability is the ease with which a reader can understand written text according to the Flesch reading ease score formula. Try to match the target number, which is an average for your top 10 competitors on Google. The add-on will also identify hard to read sentences, long words in your text and also long paragraphs. Using the readability score will help you create text that is user-friendly. Naturally the more readable a piece of content is, the more likely a user is to read through the entire thing. This feature is available for English, German, French, Spanish, Italian and Dutch. You can set your own target readability manually by clicking on the pencil’s icon. SEO Writing Assistant also checks your text for keyword stuffing. If any keyword you target is used too frequently in your text, you will see a warning. 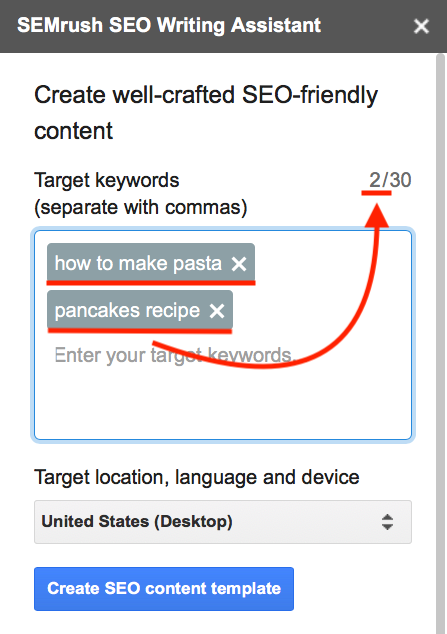 This keyword will be highlighted with orange in the ‘Recommended keywords’ and ‘Target keywords’ section. Hover over it to see the details. Try to avoid using a keyword more than 3% of the whole text, as keyword stuffing can result in punishment from Google. Another feature of the SWA is the ability to gauge a document’s tone of voice. The tone of voice depends on the words you’re choosing to use, the rhythm, the word order and pace. Your tone can be considered very casual, somewhat casual, neutral, somewhat formal and very formal. Not only can you see where your text lies on this scale but you can also see your most casual and most formal sentences. You can set or change your target tone of voice by clicking the pencil icon in the top right corner. The target tone you ultimately choose will depend on the type of content you are writing. If you are writing an academic piece you are probably going to want it to be more formal than a blog post. If some of your sentences are differing from your overall tone of voice, SEO Writing Assistant will point those sentences out for you so you can change them if you see fit. To access the plagiarism checker, click on the ‘Plagiarism’ tab at the top right and click on the ‘Check’ button. This feature detects the total number and percentage of copied words in your text and even identifies the original sources of content from across the internet so you can verify any plagiarized text. Once you’ve changed the text in your document, you can recheck it for originality by clicking on the ‘Recheck’ button. The keywords you use to generate your content templates will be taken from your SEO Ideas units and depend on your monthly subscription. Free users can generate a template only once. Every time you generate a template for one keyword — whether in SEO Content Template or directly in SEO Writing Assistant — one SEO Ideas unit is charged. If you generate a template for two keywords simultaneously, two SEO Ideas units are charged respectively, and so on. If you enter the same keyword several times, one SEO Ideas unit is charged every time you do this, as the new template will be generated based on the current SERP. When you send your template from SEO Content Template to SEO Writing Assistant and open it in Google doc, no extra units are charged apart from those you’ve used in SEO Content Template, unless you edit your target keywords. 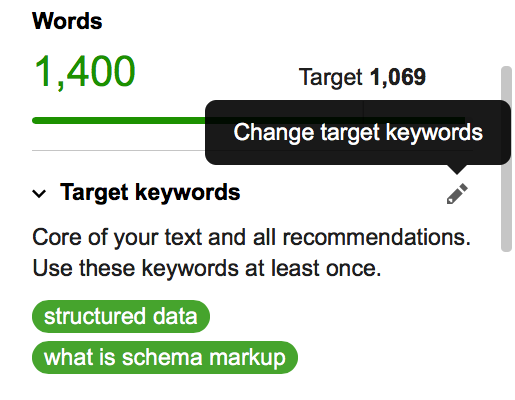 If you edit your target keywords right in the SEO Writing Assistant, the new template is generated and you are charged with the respective number of SEO Ideas units — the target keyword amount equals the SEO Ideas unit amount charged. If you would like to purchase additional limits, you can do so from your Subscription Info page. What languages does the SEO Writing Assistant support? 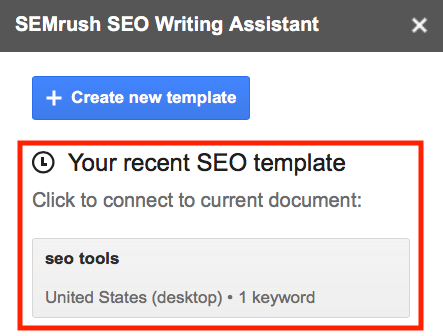 Can I use the SEO Writing Assistant without an SEMrush account? How does sharing work in the SEO Writing Assistant?